Bike commuters everywhere use panniers, or saddlebags, to store their belongings. When built well, bike panniers secure your belongings while allowing you to be more ergonomic and aerodynamic as you're riding. But they can appear somewhat precarious if you need to bring along your laptop. If the bag is not secure enough, your computer could face serious damage. However, there are high-quality laptop panniers out there for dedicated bikers. When shopping for a laptop pannier, keep in mind the following factors. First of all, a secure mounting system is a must for any pannier. This will prevent your belongings from falling off your bike. Another important quality is waterproofness — most laptop panniers come with waterproof exteriors as well as external covers. The last thing you want is water destroying your precious work files. Last, but not least, consider how much space you need. The amount you need depends on your laptop size as well as how many belongings you have. While more volume and pockets are great, it can be a hassle to carry a large laptop pannier when the extra space is unnecessary. From budget picks to convertible backpacks, we’ve rounded up the best laptop panniers for bike commuters in this guide. 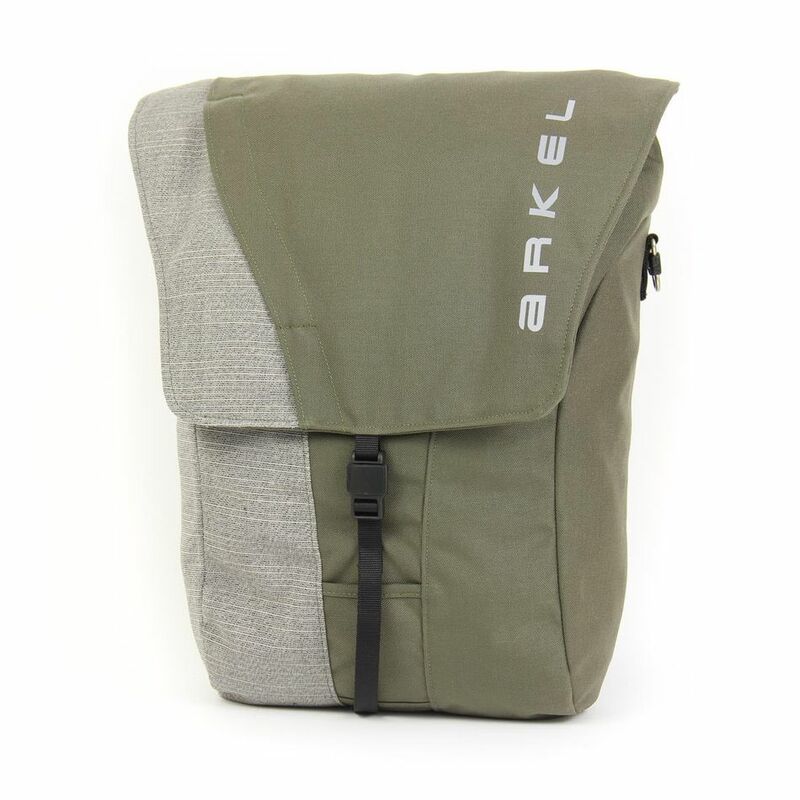 While the price is steep, Arkel's Commuting Bike Bag is one of the most highly recommended laptop panniers in the biking community. Your laptop will stay safe since the saddlebag repels water and keeps your belongings protected against shock. It’s weather-resistant on the outside and also lined with waterproof fabric on the inside. Additionally, the laptop compartment has a sturdy metal internal backplate that shields your computer against bike shocks. It will fit up to a 15-inch laptop. The laptop pannier uses a mounting system with cams that open when you pull up the handle and lock when you release it. The hooks and rail consist of strong aluminum that is lined with nylon to protect your rack. When your commute is over, just pull the shoulder strap out of the main compartment to carry it to your home or office. Other features include the two outside zippered pockets and reflective panels. For your phone and wallet, you can use the two outside zippered pockets to maximize reach convenience. When you’re riding your bike home at night, the bag has reflective materials on all of its sides so that you remain visible in the dark. The Seattle Sports' Titan bag is one of the most affordable, high-quality panniers that you can get. It’s waterproof, spacious, and comes with heavy duty hooks that clip to most bike racks. The Titan also has a zippered outside pocket for storing small items. Other useful features include compression straps to stuff in larger loads, as well as reflective panels for nighttime visibility. The bag will be able to fit a 15-inch laptop, though we do recommend putting it in a padded pouch first. It has a few reasonable limitations, given its modest price. First of all, the pannier does not come with a shoulder strap, so you will need to carry it by holding onto its handles. Additionally, it only has one saddle pouch. However, you could also buy another one, and the combined cost of both will still cost less than most panniers. Suer, this set of panniers is a hefty investment, but a worthy one nonetheless. The bags use a quick lock mechanism with hooks that automatically open when you pull up the pannier handles. Built for long-distance bike touring, they are perfect for commuters who need to carry a lot of gear over long, intense rides. In total, the panniers offer 2,500 cubic inches of storage space. Each has a waterproof main compartment with a hermetic roll closure to keep your gear dry. There’s also an internal zippered pocket and laptop sleeve inside for electronics and small items. Ready to go? The strap and buckle closures work as shoulder straps when you’re off the road and want to carry the panniers. The bags also have reflective patches for visibility during nighttime commutes. There are many bells and whistles in this set, but what makes it a favorite in the biking community is its durability. Each bag has a waterproof coating and welded seams for maximum weather protection. At 2.9 pounds and 14.6 inches in height, this dual laptop pannier from Timbuk2 will allow you to carry what you need for your commute, nothing more and nothing less. It includes an internal padded 15-inch laptop pocket to keep your computer safe. On the outside, there’s a front zip compartment for small accessories. The Timbuk2 Tandem attaches to most bike racks easily with two hook and loop straps. Once you’re home or at the office, you can transform the pannier into a messenger bag using the removable shoulder strap. The built-in magnet will clip the sections together for a slim profile when you’re carrying the pannier. The colors include jet black, black, and gray. When there’s rain or snow, you’ll want to keep your laptop as protected as possible. To do so, you’ll want to shield it from wetness as well as swinging motion. In terms of water protection, Ibera’s weather panniers consist of water-resistant 1680D nylon. Each set also comes with all-weather covers for extra shielding. The panniers also use a three-point interlock process to secure them from side swing when you’re riding, so they won't fall prey to turbulent, windy weather. They attach and release easily to bike racks, but still feel secure when you’re riding. You can adjust the panniers for non-Ibera racks by changing the bottom hook position of the mounting system with a hex wrench. Each bag will store up to 15 liters of volume each. They have multiple compartments, including two zippered pockets and two large inside pockets, where you can place your laptop. They each come with a reinforced handle so that you can carry them when you’re not riding. Panniers, while convenient for commuters, are not always easy to carry. Two Wheel Gear’s convertible backpack sports an excellent design that allows it to attach to a bike rack with ease using its built-in straps. A center lock and lower side strap keep the bag secure to your bike rack when it functions as a pannier. To carry the backpack around, pull the shoulder straps from the rear compartment and clip them to the lower side strap buckles. The backpack includes a 15-inch laptop sleeve, phone pocket, U-Lock storage, bottle pockets, pen holders, and internal mesh zip pockets — everything you need in a reliable work bag. Commuters will also appreciate the bag’s top handle, clip for lights, reflective details, key leash, and adjustable sternum strap. Colors include black and graphite. You won’t need to worry about rainy days. The main model of the convertible laptop pannier consists of waterproof polyester. An alternative version of the backpack is made of waterproof military-grade dry waxed canvas. All versions of the bag come with a rain cover for extra protection. Many panniers have bulky forms, but there are neat and streamlined ones out there. Brooks is an English company that makes high-quality bike accessories with timeless designs. The leather Suffolk pannier has a detachable shoulder strap that allows you to remove it effortlessly from your bike. It mounts very securely; it uses the Ortlieb system, which features an automatic release mechanism for attaching and detaching the pannier. The pannier will fit most racks because its QL hooks can be adjusted. The bag features large front pockets, side pockets, and an elastic net. It also has a four-way stretch design that can accommodate 22 liters of belongings. Since it doesn’t have a dedicated laptop compartment, we recommend using a padded laptop case. Colors include black and green. Besides its accommodating design, the travel pannier also consists of Blue Sign certified textiles and vegetable-tanned leather. The certification indicates that the production process meets strict sustainability and consumer safety standards. Bike commuters who work in formal offices will appreciate the versatility of this pannier from Two Wheel Gear. In it, you’ll be able to hang up to five items, store shoes, and fit various accessories. The bike saddle has plenty of space to keep your clothes neat, clean, and wrinkle-free. The pannier also includes ample room for organizing your other belongings. It sports three internal mesh pockets, five external organization pockets, and a 17-inch laptop padded pocket. In addition to its storage capacity, it also features a fluorescent rain cover with reflective details that keep your belongings dry and you visible during the night. Though it's perfect for biking commutes, the pannier also works for your business flights, since it meets standard airline carry-on requirements. Colors include black and gray.